Cops are looking for a gunman who robbed a 28-year-old man in the East Village at around 5:45 a.m. on Thursday. The victim was in front of 201 Second Avenue and East 13th Street when a man turned a gun on him and demanded his phone. The victim refused and kept walking and the mugger hit him several times on his head before fleeing emptyhanded. The victim was treated for multiple cuts at Bellevue Hospital. The suspect is described as black and 20-30 years old and was last seen wearing a yellow/blue hooded jacket, black pants and gray sneakers. Anyone with information in regard to this incident is asked to call the NYPD’s Crime Stoppers Hotline at 1-800-577-TIPS (8477) or for Spanish, 1-888-57-PISTA (74782). The public can also submit their tips by logging onto the CrimeStoppers website at nypdcrimestoppers.com on Twitter @NYPDTips or by texting their tips to 274637 (CRIMES) then enter TIP577. All calls are strictly confidential. Cops are on the lookout for two muggers who held a resident of Peter Cooper Village up at gunpoint on Tuesday night. Police said the victim, who is 16 years old, was walking home at about 11:10 p.m. when he was confronted by the pair in the vestibule of 510 East 23rd Street. One of the robbers pulled out what appeared to be a real gun while demanding his property. The victim then turned over $90 in cash and his iPhone and the muggers fled towards the FDR Drive. The suspects were described as male and black, one wearing a blue hoodie and black sweatpants and the other wearing grey shoes gray sweatpants and a black coat. Robberies by roving groups of teens have been a problem, especially in local parks, for the last month, according to the 13th Precinct’s top cop. Deputy Inspector Steven Hellman made the announcement regarding recent crime stats at the 13th Precinct Community Council’s monthly meeting last Tuesday. Town & Village reported at the beginning of this month that three teens were arrested for a robbery that took place in Bellevue South Park and the same week, three other teenagers were caught for an assault at the Asser Levy playground. Both incidents were at the end of September. Police have arrested a 29-year-old man in connection with four armed robberies, including a holdup at a bar near Stuyvesant Town. Police said the suspect, Sanjay McBayne of Carroll Street in Brooklyn, was arrested on Saturday after police received a tip through the Crime Stoppers hotline. Police said the most recent incident was on Thursday, October 4 at around 2 a.m., when McBayne strolled into Mona’s Bar and Grill at 224 Avenue B between East 13th and 14th Streets, and turned a gun on an employee, demanding cash. After getting away with $700, he allegedly fled towards 14th Street. The other incidents were all in Brooklyn. From September 26 to October 3, McBayne allegedly hit three businesses, a Duane Reade, Kilo Bravo nightclub and a Metro PCS store. Police said in those three alleged robberies, he approached an employee and then threatened the victim with a gun, netting a total of $815. McBayne has been charged with four counts of robbery. Police are looking for a man suspected in a gunpoint robbery that took place in a video store at 725 Sixth Avenue on Sunday, April 22 at 2:50 a.m. Police said that the suspect approached a 50-year-old store employee behind the counter, turned a gun on him and demanded all the cash from the register. The employee gave him $900 and the suspect ran north on Sixth Avenue. No injuries were reported as a result of the incident. The suspect is described as a black man in his 20s, approximately 5’5” and 145 lbs. He was last seen wearing a dark cap, a dark hooded sweat jacket and light-colored pants. Anyone with information in regards to this incident is asked to call the NYPD’s Crime Stoppers Hotline at 1-800-577-TIPS (8477) or for Spanish, 1-888-57-PISTA (74782) or visit nypdcrimestoppers.com. Tipc can also be texted to 274637 (CRIMES) then enter TIP577. All calls are strictly confidential. Police arrested a 41-year-old John Doe man for allegedly menacing someone in front of 39 Union Square West on Thursday, April 26 at 12:23 p.m. Police said that the man punched a victim in his waist. When the suspect fled the scene, officers saw him throwing an ice pick into a garbage can inside Union Square Park. When police attempted to place him under arrest, he allegedly flailed his arms to prevent himself from being handcuffed. Cops referred to him as John Doe because he had no ID. Police are looking for a man who robbed an employee of a Dunkin Donuts on the street on Monday, April 16, taking $3,500 of the shop’s money she had with her. The 26-year-old victim said at about 11:40 a.m. she was at the intersection of East 17th Street and Union Square East on her way to a nearby bank with the business’s proceeds, when a man approached her from behind, asking for directions. When she turned around, the man pulled out a knife and grabbed a paper bag from the victim’s hand, which contained the $3,500. The mugger then fled into Union Square Park and the victim was uninjured. Asked if this was being investigated as a possible inside job, a police spokesperson said the department couldn’t speculate on this. Cops are looking for a man who robbed a woman at gunpoint in Gramercy shortly after midnight on Sunday. Police said the woman was walking past 201 East 20th Street at Third Avenue when the man approached her, pulled out a small, black handgun and demanded her cash. The woman turned over her money, putting it into a bag the man had and he fled the scene. She was uninjured in the incident. It isn’t clear how much money she lost and police don’t have a description of the suspect although he was caught in some grainy surveillance footage. Anyone with information is asked to call the NYPD’s Crime Stoppers Hotline at 1-800-577-TIPS (8477) or for Spanish, 1-888-57-PISTA (74782). The public can also submit their tips by logging onto the Crime Stoppers website or by texting their tips to 274637 (CRIMES) then enter TIP577. All calls are strictly confidential. Cops are looking for a man who robbed a Ricky’s beauty supply store in Kips Bay at gunpoint. Police said that on Wednesday night, the man walked into the business at 369 Third Avenue and 27th Street, turned a gun on a worker and demanded cash. The employee turned over $217 and the robber fled north on Third Avenue. No one was injured in the incident. The suspect is described as being black, in his 40s and about 5 ft. 8 ins. tall. Representatives for Ricky’s, which has 19 locations, declined to comment. Anyone with information is asked to call the 13th Precinct Detective Squad at (212) 477-7444. UPDATE: Police have linked the suspect to two other robberies. On Sunday, February 18 at approximately 10:35 p.m., police believe the same man turned a gun on an employee at a Harlem 7-Eleven at 1400 5th Avenue. He then jumped over the counter and helped himself to $100 from the register before fleeing. On Sunday, March 11 at almost 9 p.m., the man robbed a 47-year-old woman in her car in Brooklyn. Police say he opened the door of a Ford Explorer that was double parked in front of a Brooklyn bakery at 139 Smith Street and turned a gun on the driver. The victim was able to escape the car, but the gunman got away with her purse, which contained $200 in cash, four credit cards and four debit cards. The suspect fled east on Dean Street. Police are on the lookout for two robbers who threatened two victims with a razor blade on East 22nd Street and Park Avenue South on Monday afternoon. Cops say the pair approached two 19-year-old men, at 4:20 p.m. and pulled out the blade while demanding money. They ended up getting away with a phone and $10 in cash. The victims weren’t hurt. Police are hunting a robber they say threatened to shoot a man who was stuck in traffic in Union Square. According to police, the victim, a 35-year-old man, was in his car on East 13th Street between Broadway and Fourth Avenue, when the other man opened the rear door and got in. He then demanded money, threatening to shoot the victim if he didn’t comply. The victim turned over his cash and the mugger fled the car. It isn’t clear if he actually had a gun. The incident occurred on July 21, but police only released an advisory on Thursday night. The suspect is described as black with a dark complexion and 30-35 years old. He was last seen wearing a white short sleeved shirt, black and blue baseball cap and dark sunglasses. Anyone with information in regards to this incident is asked to call the NYPD’s Crime Stoppers Hotline at 800-577-TIPS or for Spanish 1-888-57-PISTA (74782) The public can also submit their tips by logging onto the Crime Stoppers Website at nypdcrimestoppers.com or texting their tips to 274637(CRIMES) then enter TIP577. Police are hunting a gunman they say robbed a bank in Union Square on Wednesday. 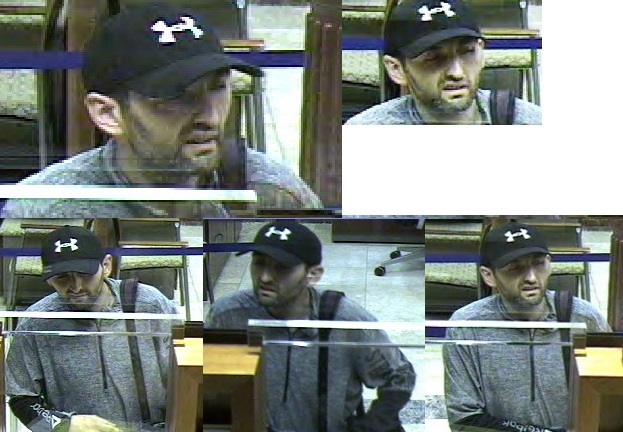 At around 4 p.m., the armed robber strolled into the Amalgamated Bank at 10 East 14th Street between University Place and Fifth Avenue and demanded cash, cops said. A teller complied an he then fled with the loot and a dye pack. After he escaped the bank, the dye pack exploded. The suspect has been described as a white male, 5’7″ tall and weighing 150 pounds. Anyone with information in regards to this incident is asked to call the NYPD’s Crime Stoppers Hotline at 800-577-TIPS. The public can also submit their tips by logging onto the Crime Stoppers Website at http://www.nypdcrimestoppers.com or texting their tips to 274637(CRIMES) then enter TIP577. On Saturday, police arrested a man they believ to behind a string of armed heists at businesses near Stuyvesant Town and in the East Village as well as in another neighborhoods. Kenneth Nottage, 47, who police said lives in Gramercy at 347 East 18th Street, was apprehended in the 19th Precinct, which covers the Upper East Side. Over the weekend, police had circulated a wanted poster for Nottage, at the time listing his last known address in Staten Island. Nottage was collared after allegedly hitting a dozen stores in nine days, in each case either pulling a knife or simulating a gun while demanding cash. One shop employee told Town & Village last week he’d worn a stocking over his face. Police said he is facing four counts of robbery for the third, seventh, ninth and 12th incidents, while the others are still being investigated by the Central Robbery Division. He’s also facing burglary charges. In just one of the incidents, despite an alleged threat to shoot an employee, Nottage left the store empty-handed, after an employee gave him a shove. He then allegedly demanded that the cashier, another employee, open the register and give him cash. The workers refused and one shoved Nottage, who then ran out of the deli. A spokesperson for the NYPD and the D.A. did not have additional information as to how Nottage was apprehended. He has three prior arrests although no information was available as to those incidents, and his next court appearance is scheduled for April 17. Nottage’s Legal Aid attorney, Richard Charney, declined to comment on the charges. Police are looking for a man they say committed six armed robberies (and attempted a seventh) in the past few days at businesses near Stuyvesant Town and in the East Village. In each of the incidents, he’s either pulled a knife or simulated a gun before swiping cash from the registers, cops said. At 3:25 a.m. on Thursday, April 2 at One’s Fruit and Grocery, 315 First Avenue between 18th and 19th Streets, he got away with $400. At 10:20 p.m. on Saturday, April 4, 2015 he returned to One’s Fruit and Grocery and this time made off with $950. At approximately 2:15 p.m. on Sunday, April 5 at I.Q. Decor, at 242 East 14th Street and Second Avenue, he got away with $366. At 3 a.m. on Monday, April 6 at I Green Market, 271 First Avenue between 15th and 16th Streets, he took $600. At about 5 p.m. on Monday, April 6 at a book store at 66 Avenue A and East 5th Street he took $200. Later that evening, at around 9 p.m., he headed to 13 Avenue A, home to New Up and Up Laundry, and ran off with $250. At 1:45 a.m. on Tuesday, he attempted to rob East Village Fruit and Vegetable at 229 Avenue B, police said, although this time he left empty-handed. Police have described the suspect as white and in his 40s. Chung Young, a woman who was working at I.Q. Decor when the store was held up, said the robber had pulled out a small knife. Young, who was the only person at the shop at the time, which is owned by her mother, said the man told her, “Give me money and I won’t hurt you.” She complied, giving him all the money in the till. Young said she was “scared a little bit” since she was alone in the store. She still hasn’t told her mother about the incident, since she didn’t want to upset her. “She’s on vacation,” Young explained. Kevin Kim, a manager at I Green Market, also said the man had showed a knife. Though Kim wasn’t there at the time it happened, he said he also heard that the robber hid his face with a stocking. Police are asking anyone with information to call the NYPD’s Crime Stoppers Hotline at 800-577-TIPS. The public can also submit their tips by logging onto the Crime Stoppers Website at nypdcrimestoppers.com or texting their tips to 274637(CRIMES) then enter TIP577. All calls are kept strictly confidential.